For the complete edition become a member of The Spitfire Society and access it in the member's area. Mo's Opening Chatter Do you enjoy being a member of the Spitfire Society like me? If so, perhaps you could help to expand our numbers here in Canada by promoting our society amongst your friends and even family members. At present I am looking at ideas as to how our members could enjoy a more active role in the Spitfire Society and thus enjoy it to its fullest. 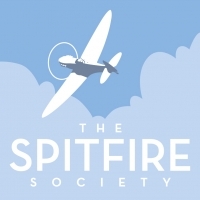 I know that we are a big country and most members live far afield from one another, but I am sure that if we all spread the word that the Spitfire Society is here and what it is all about together we might encourage others to be interested and join our ranks. Please bear in mind that our few dear ex-pilots of WWII are in their nineties and those of us who were children during WWII (like me) are in their eighties so I think you would agree that we need to bring in the younger generations. Also I am truly sure they would enjoy what we would have to offer. There are a few ideas being followed up to develop benefits of being a member. First of all HQ is endeavouring to contact Canadian Air Museum to request that they offer free entry to Spitfire Society members. Quite often that also includes about a 10% discount on purchases made in their gift shops. Fingers are crossed on this item. I should imagine that you would just have to show your Membership Card on hand to prove that you are a member. On noticing that discounts are offered in the UK by a number of businesses, I am sure that could be arranged here in Canada with some of our stores. I shall follow that up, but unless we have more members I am not sure that can be achieved. But it is still worth trying. This is all food for thought. So here we are at the end of winter (I think). Spring will soon be here with summer quickly following. Enjoy! And I hope that 2017 will be kind to you! Cheers! We received the very sad news about the passing of David TOWER, a previous member of the Spitfire Society for many years until his health situation took over. He lived in Calgary, Alberta. A few years back I visited Fiona, David’s wife, and thoroughly enjoyed her company for the full weekend I stayed there. She took me in one day to visit David and it was very sad to see how dementia had taken over, but he was still able to give his lovely smile. Being only 61 years old when he died is far too young to go. David was a very accomplished pilot. He had adored ‘planes and flying ever since the age of three when his dad, who was a Corporal in the Canadian Air Force, had taken him on a flight in Trenton, Ontario where he was based. It was a love that stayed with him all his life. Apparently, in his teens, David was an Air Cadet, although that should not be surprising of which to learn. Then throughout his life he flew all kinds of aeroplanes starting with a Musketeer. He flew a Phantom too and a F# Tornado. However, it was the Spitfire that he yearned to take a flight in and so he did when he lived in England for a spell with his wife and family. Also, whilst based in the UK, David received the Spitfire Trophy from the Spitfire Society. It was presented to him by Grp Capt David GREEN, the founder of the Spitfire Society, and Sqn Ldr Leonard DICKSON who later served as National Chairman of the society. The trophy was awarded to David and Flt Lt Jon NORTON for their performance in air-to-air gunnery. David was such an accomplished person of a pleasant personality. He will be sorely missed.